An animated romp, this is not. Be advised, there is no cartoonish bear singing about the “Bare Necessities”, Andy Serkis’s new film is based more faithfully on the source material of Rudyard Kipling’s The Jungle Book series of stories. It’s pretty easy to forget that all of those Disney tales that kept us entertained as kids aren’t original Disney stories. Nope they are almost all based on decidedly darker morality tales from generations past when an evil witch wasn’t banished to a land without candy and rainbows, she was beheaded. What I’m trying to say here is that this isn’t a movie for young kids, 10 and up would be my suggestion. Based on Kipling’s short story collection, All the Mowgli Stories, while itself is a compilation of all of Mowgli’s adventures from his two The Jungle Book novels, Mowgli: Legend of the Jungle follows the upbringing of the boy from when he’s found as a tiny “man-cub” to his eventual seat as a leader in the jungle. It’s directed by Andy Serkis who, if you didn’t already know, is THE name in motion capture CGI performances, Gollum, Caesar from Planet of the Apes, Supreme Leader Snoke.if there’s a major CG character in a big-budget movie, he’s probably the guy playing him, needless to say the film achieves its talking animals through some pretty impressive CGI. 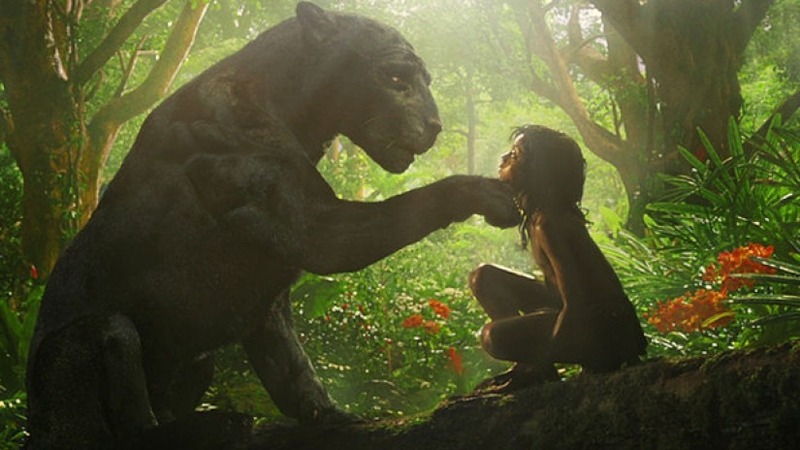 Mowgli is found by the black panther Bahgeera (voiced by Christian Bale) and brought to the wolf pack. There he is adopted by a wolf family and put under the protection of the pack by it’s leader, Akeela, from Shere Khan (Benedict Cumberbatch), the tiger who killed Mowgli’s mother. Mowgli grows up with the pack believing he is a wolf and finding comfort in his brother and fellow outcast Bhoot (Serkis’ son, Louis) an albino. As Mowgli grows he begins to realize he is different, and even with the teaching of the pack’s tutor, Baloo (played by Serkis himself) and advice of surrogate big brother Bagheera the differences become more clear. Meanwhile Shere Khan lurks at the edges waiting for the opportune time to finish what he started with Mowgli’s mother and passing the time by killing cattle and drawing the attention of Man. Overseeing all of this is the de facto “mother of the jungle” Kaa (Cate Blanchette) who “has seen all, past and future” and narrates our story. Not having been a fan of the Disney version of The Jungle Book (I didn’t dislike it, just had no interest), I really had no stake in the game for this one. I did, however, go in with the idea of that movie in my head which ended up being a mistake that culminated in one of the most effective gut punches a movie has ever delivered to me. Serkis has taken the core story and stripped out the silly leaving a story about family, rejection, force of will, and the brutality of nature. I’m not trying to make this out to be some ground-breaking flick, but it was incredibly well done and kept my rapt attention throughout. The performances and motion capture technology is really where the heart of the film lies. This is what gives these animals life and makes you really accept them as you would a human with emotion and thought. If this is how PETA sees animals all of the time, then I can kind of see where their vigilance comes from. Benedict Cumberbatch’s Shere Khan is menacing and cunning, Cumberbatch may play hero more than villain these days but he’s got a voice built for evil deeds. Christian Bale’s Bagheera is really where the performances hit their apex, he may get a lot of flack for his Batman voice but as the faithful friend and protector of Mowgli he projects an entire range of emotion simply through inflection and pitch. The assistance of mo-cap adds to this translating the actors exact facial expressions through to the CG world resulting in a movie that makes you forget for a minute that, no…animals can’t really talk. It’s these performances that really set up the blow for a death reveal ¾ of the way through the movie that literally left me speechless. Let’s just say I’ll see a hunter’s “trophy wall” the same way again. If the jungle side of the story is its strength, then its human side is unquestionably the weak spot. Mowgli is eventually banished from the pack and recovered by a nearby village where he is taking in by a British hunter (Matthew Rhys) that’s been hired to take out Shere Khan and looked over by a villager played by Frieda Pinto. The problem here is that the entire segment is done over a short period with barely a word spoken (Pinto says nothing throughout the movie). It’s basically a montage of Mowgli getting a bath, playing with the other kids in the tribe, and learning a few things from Pinto’s character and the hunter, Lockwood, after which Mowgli accepts that he is both man and wolf. I get that they didn’t really have time with what was allotted but it makes the ending feel a bit unearned. The film clocks in at just over 90 minutes, in a world where it’s hard to find a sub-2-hour movie surely they could have written in a few scenes to have this aspect of the story make more sense. Mowgli: Legend of the Jungle is fun, exciting, heartbreaking and uplifting all at once. I’m left wanting to see where Mowgli and the pack go from here, and while the film doesn’t directly set up a sequel it’s obvious that there are more stories to tell. There is quite a bit of jungle violence and some very disturbing imagery so I’ll repeat my earlier suggestion that you don’t let the little ones watch without checking it out yourself first. The film is being released simultaneously on Netflix and in select theaters which, depending on its performance, could be the start of a new model for film release.